Fuel misers | What Car? The chief fuel misers are the three new 2.2-litre turbodiesel engines (136bhp E200 CDI, 170bhp E220 CDI and 204bhp E250 CDI), which all average 53.3mpg, with CO2 emissions of 139g/km. That's up to 14mpg and 32g/km better than the current car. The new petrol engines are 1.8-litre direct-injection turbo units which will eventually succeed heavy, thirsty mid-sized V6s right across the Mercedes range. 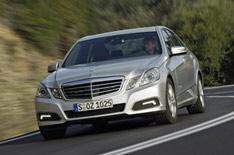 In the E200 CGI the new engine develops 184bhp and averages just under 41mpg with CO2 emissions of 159g/km, while the 204bhp unit for the E250 CGI returns a respectable 38mpg with emissions of 175g/km, despite a standard five-speed automatic gearbox. The savings are up to 8mpg and 49g/km compared with today's E-Class, and there are hints of a sub-150g/km model to come. The petrol line-up is completed by another direct-injection engine, the 292bhp V6 E350 CGI, and the 388bhp V8 E500, and there's one more diesel the 231bhp V6 E350 CDI. There will again be a high-performance E63 AMG, too, belting out 525bhp from a 6.2-litre V8.